After my recent annoying experience with NYPD* while walking home after work I decided to change my EDC knife from Buck Strider folder to Spyderco Salt I. I know they sell fully serrated version which would be better for it's real purpose (sailing/rope cutting) but for all around knife I chose plain edge. 2) Not rusting so perfect for kayaking since I hate having multiple blades. I'm a firm beliver to use what you have becasue that's how you get better in handling that particular tool. 3) Smaller blade meaning better fit in the pocket. All of the above is true about the knife. 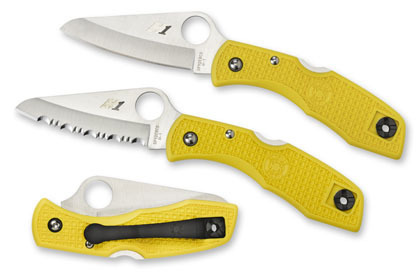 It is small, has a reversable clip, handles are "harsh" so it will stay in your hand, blade has a wide surface area in order to accomodate thumb hole on small blade, lanyard hole and pretty sturdy lock. How rust proof it is I will know after the season. I wish yellow was more yellow. It is kind of wash out yellow not a deep life jacket yellow but it still stands out. Comming from bigger folders both for work and EDC this knife is little too thin for my taste. I don't have big hands and when I got it I felt like I'm holding a toothpick. This may be my biggest problem with it but only time will show. Also this is one of the first knives I ever owned without a liner lock. I had a small accident with Buck knife that had a back lock and it almost costed me my pinky. I like the knife a lot. I think that it will fit the purpose. As a matter of fact I like it so much I'm thinking of buying one more and ditching the Buck/Strider all together. It will fit perfect on my vest right on top of the trauma plate pocket. I think the size of the blade is perfect and I only used the 4 inch blades until now and going to 3 inches was weird. *I was "detained" while going home after work @ 1 am becasue I had a folder clipped to my pocket. I missed the train, got home 2 hrs late just to have to wake up in 2 more hours to go back to work. PD appologized after seeing my ID/shield and it was very civil but it was just annoying and time consuming since the officer first involved didn't have much time on the job and some things were happening little too fast for him. I was looking at the brother of this (sheepsfoot blade) to carry on my person while on the river. Yellow and maritime looking are good for those around us who are scared to use a butter knife. Let me know how the corrosion resistance holds up. I wonder what they would have done if you were not an EMT / Firefighter. It looks like a nice knife - I don't think the 3 inch blade should prove to be a problem. Glad to hear another opinion. I EDC the knife and have for 3 months +. IMHO its as good a pocket knife as I've carried in quite a few years. Because my hands are small, I don't have any problem with the thinness of the handle, and it certainly makes it oomfortable in my pocket. The choils on the back of the blade make it easy to control. The H-1 steel seems quite good. I haven't given it a lot of hard use, but one week I did cut up some cartons at work and then made up some nylon mooring lines at home, and it stayed very sharp through that (I've had knives that didn't). The paint on the clip is disappointing - already showing scratches. But the metal under it seems to be rustproof, so hopefully its just cosmetic. Sorry to hear about your incident. I wouldn't have thought a knife of this size with this type of blade would get more than a glance. It's pretty obviously designed as a tool, not an offensive weapon. Keep us posted on how the knife works for you. I think that clip is made out of titanium. Things are getting "strange" when such a knife gets attention. I am glad I am no longer assigned to NYC. I carried my Buck 110 everywhere then (1979-1981) as now. It was my blue jeans that attracted attention then. It has always been my understanding that a 3" knife was good to go, anyhere in the USA. I think I will stay away from the large cities from this point forward. It was my Buck/Strider folder that was questioned. Spyderco Salt is my new folder. Rereading the first and last paras of your first post, that's clear. Which once again reminds me to pay closer attention. Good survival skill, paying attention. I need to work on it. What are the rules/regs as far as travel by train in NYC and weapons? Obviously firearms are out of the question, but how do they treat knives? Are they banned outright or is there a blade length restriction? And weren't they subjecting folks to random searches not too long ago on the subways in NYC? That's been my general understanding too, but, does anyone out there follow the laws enough to know if that's reality? I don't really think/worry about the knife/knives/multi-tools I might be carrying except if I have to take an airplane. Generated in 0.054 seconds in which 0.029 seconds were spent on a total of 14 queries. Zlib compression enabled.